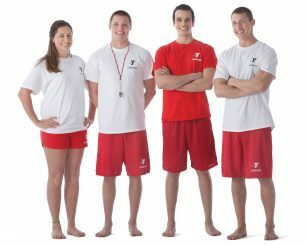 If you’re 15 or older and looking for a great part-time job or a challenging career, that’s in demand, the American Red Cross Lifeguarding Program is one of the best places to start. Rescue skills for use in the water and on land. First aid and professional rescuer CPR/AED training to help you prepare for an emergency. Surveillance skills to help you recognize and prevent injuries. Swim a minimum of 550 yards continuously in a prone position. Swim 20 yards, feet-first surface dive to a depth of 7 to 10 feet to retrieve a 10-pound object, return to surface swim 20 yards hold an object with both hands keeping face at or near pool surface. Swim 5 yards, submerge and retrieve three dive rings placed 5 yards apart in 4 to 7 feet of water, resurface, and swim 5 yards to the side of the pool. Choose the class that works best for you!